When in doubt what your problem is, please consult us first. Not only can we direct you to the correct specialist when needed, but many times the problem may be simple and seeing us first may save thousands in unneeded tests and emergency room visits. Budincich Chiropractic offers preventative and natural pain management, to help alleviate the need for expensive and potentially harmful drugs. We use diagnostic tools including postural analysis coupled with visual and touch to create a customized course of treatment for you. Dr. Budincich has taken over 200 hours of postgraduate chiropractic education in Orthopedics offered by his Alma Mater. This, in addition to his experience has honed his skills at taping and casting sprains, fractures and chronic athletic injuries. He is also proficient in treating planter fasciitis and casting orthotic devices for athletes, arch and heel pain sufferers and for pronation (flat feet). This is a radiant deep heat that is similar to the function of a microwave oven, operating at frequency of 2750 megahertz. It works well for arthritis pain relief, chronic back pain, and deep chest congestion caused by viral colds, bronchitis, or pneumonia. It has given great relief for knee arthritis, tennis elbow, ankle sprains, shoulder bursitis, and knee and wrist tendonitis. This includes Faradic stimulation, Inferential stimulation, Sinusoidal stimulation, and Galvanic stimulation--all work well for the relief of muscle spasm and pain in the soft tissues. This is the first therapy used in chiropractic. It is a simple yet effective heat treatment to ease sore and spasmed muscles. It is also used to prepare a patient for a deep tissue massage. Our hydrotherapy allows you to get a deep hydro massage without even getting wet or undressed. 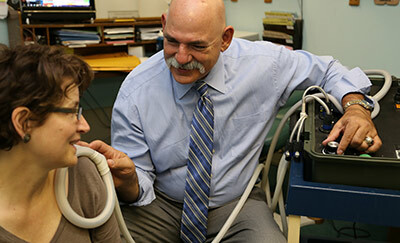 This non-invasive modality uses electro-magnetic pulsing to disperse and increase blood flow to areas of pain. This is often used to treat sports-related injuries, migraines and arthritis. Originally developed by Nicola Tesla, this treatment is widely used in Europe, especially in the horse racing community. 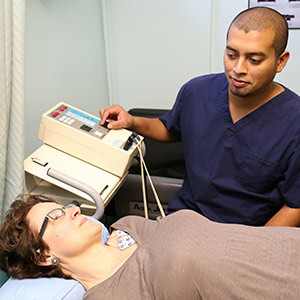 Ultrasound may be the most widely used physical therapy modality among therapists, chiropractors, medical physicians and podiatrists. It was invented by a chiropractor over 100 years ago. It uses the vibrations from a quartz crystal energized by an electrical current to send sound waves into the body at 0.800-1.2 million cycles per second (one megahertz). The tissue is stimulated by ultrasound and increases micro circulation promoting faster healing and swelling reduction. A type of this technology is used to image unborn fetuses and in diagnostic ultrasound of soft tissues. Diversified technique is a compilation of many manual manipulative techniques developed over the past 110 years. This is by far the most commonly practiced technique amongst chiropractic doctors. Cox technique was developed by Dr. James Cox of Ft. Wayne, Indiana. Dr. Cox used the basics of "flexion distraction" pioneered by Dr. McMannis, an osteopathic doctor using his own designed tables built between 1909 and the 1950's. Dr. Cox then developed newer generation tables called the Cox-Barnes table and the Cox-Lloyd table. Our offices use the Cox-Barnes and McMannis tables for non-motorized flexion distraction, and Leander and Eckard tables for motorized "motion assisted adjusting" and flexion distraction techniques. The purpose of the Cox technique is to reverse the force of gravity on the discs and facets with a deep, long axis, flexion motion. This technique has the power to reverse a herniated disc condition of the lower back or neck in many cases, and thereby prevent back or neck surgeries. This is an active and doctor directed spinal decompression technique. Leander technique was developed by Dr. Budincich's longtime, personal friend and mentor, Dr. Leander Eckard of St. Maries, Idaho, and was initially designed and built in his airport hangar in Port Orchard, Washington. Dr. Leander, with his amazing mechanical and chiropractic skills, developed a table and technique that took the Cox technique to new levels of effectiveness. With a unique drop-away pelvic section, pregnant women may be adjusted on their stomachs up to the ninth month of gestation safely and with great relief. Dr. Leander's techniques are also Dr. Budincich's main procedures for the treatment of chronic and acute lumbar herniated disc conditions, and chronic and acute lumbar facet syndrome and facet disease as well as the pain of scoliosis and spinal stenosis-without surgery. Budincich Chiropractic uses these sophisticated examination and treatment tables to allow maximum access for thorough diagnostic and therapy purposes. Our deep tissue therapists are sought after due to their deeper pressure that is effective at getting to the "knots" and trigger points in the soft tissue. Sure there are inexpensive massage parlors charging a low fee for a general foot massage and general relaxation by non-certified, non-english-speaking newcomers. But if you want professionally focused, deep muscle therapy, our therapists will focus on the hot spots where you need it most. We plaster cast to get an exact fit and have custom orthotic devices fabricated by our laboratory in Valencia and other locations. We analyze your walking gait and arch of the foot to get a proper fit. We also have less expensive KLM RX Shell orthotics available for the budget minded patient who wants good support but not an over-the-counter ("cookie cutter") orthotic like Dr. Scholl's or Super Feet. Our custom cast KLM orthotics are unconditionally guaranteed to fit, or your whole fee refunded or credited to your account. Sacro Occipital Technique, or "SOT" as is commonly abbreviated, was developed by Dr. Major Bertrand DeJarnette. This treatment is relatively low force utilizing a special "pelvic block" to de-rotate the subluxations of patients. These pelvic blocking techniques are named Category I, Category II and Category III. This technique is used often in our offices to treat the acute, severe, lower back pain patient at the beginning of treatment, and also in the chronic patient who does not tolerate a full "side posture" lumbo-pelvic adjustment well, due to arthritis or a more advanced disc condition. Activator technique is the use of a precision adjusting instrument or "activator" which the doctor uses to adjust the spine and extremities. This works well with the babies and children of our practice who are too sensitive or young for a full adjustment. We also use it on places where we have difficulty getting results with our other techniques. It works well on osteopathic women in their 70's to 90's. This therapy is achieved by applying COX, Leander and McMannis techniques on a Flexion Distraction Table. The most common of all chiropractic problems is a misalignment of a spinal vertebral segment. We locate the issue and correct it. A gentle-touch, low-pressure chiropractic technique focusing on terminal points. This requires a special table equipped with mechanical or pneumatic drop pieces. Budincich Chiropractic offers athletic injury treatment and prevention. We offer high school pre-season physicals for sports. We have specialized in these types of injuries for three decades, and have the expertise and equipment to diagnose and help most athletic injuries as well as and post-surgical rehabilitation. We are trained in the athletic taping of sprained joints and the casting of fractured bones of a simple type. Fractures are referred out if they are complex or may require specialized orthopedic care. Used primarily for athletes as a preventative for injuries or to protect a prior trauma, this technique assists muscle function without affecting circulation. We have served the USC Track and Field, and Cross Country teams for decades under many coaches. We have served PCC football, Temple City High School football, Blair High School, La Crescenta High School, Maranatha High School, Pasadena High School, Marshall High School, and Muir High School football as on-the-field sideline physicians at game time to care for the acutely injured to be able to assess injuries at the time that they occur. Our doctors over the years have conducted several thousand pre-season athletic physical exams for our local public and private schools, and Jr. All-American football leagues. Make us YOUR team's doctor, and get your players on the field faster after an injury. Acupuncture, along with chiropractic, is a safe and effective way to receive pain relief and health benefits through Chinese medicine, without the possibility of harming the body through chemical or surgical intervention. These two medical treatments—acupuncture and chiropractic—have complimented each other greatly in the several years that we have been offering them together at Budincich Chiropractic Clinic. We offer acupuncture for anti-aging, anxiety relief, drugless pain therapy, and acupuncture "seeds" for a myriad of conditions such as food cravings. Acupuncture offers an excellent alternative to pain medication, by being natural and not physically traumatic. Acupuncture is good for chronic pain and also acute pain. Some of our patients may not be able to handle manual chiropractic adjustments as they reach their 80s and 90s, acupuncture offers a good alternative if they are sensitive. We also have new adjusting instrumentation called the "Arthrostim" and "Vibracussor" that are more easily tolerated than manual manipulative techniques. "When I went into Dr. Bud's office, I was carried in by my dad. I had terrible radiating pain down my legs and into my feet, and I could not walk. Within 3-4 adjustments I was up and walking and feeling so much better. I have since referred over 30 patients to Dr. Bud and my entire family gets regular wellness care. Dr. Bud adjusted both of my children a few days after they were born, and they continue to come in several times a year. Dr. Bud and his staff are amazing and they treat every patient like they were a part of their own family! 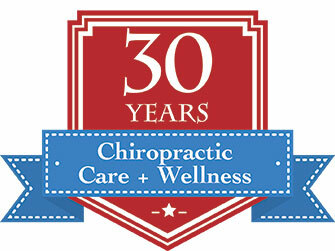 I have been to several chiropractors over the years and Dr. Bud is the BEST." - Courtney S.